From JUMP-START, we get the J. STOLE‘s THIRD letter is o. REHAB’s CENTER is, of course, h. And we wind it all up with ANY‘s SECOND letter, n.
1a [19,000+-foot Peruvian volcano] EL MISTI—I’d never heard of this and was unsure of 3d [Big name in notebooks] MOLESKINE, so the M that is common to both was the last letter in my solve. 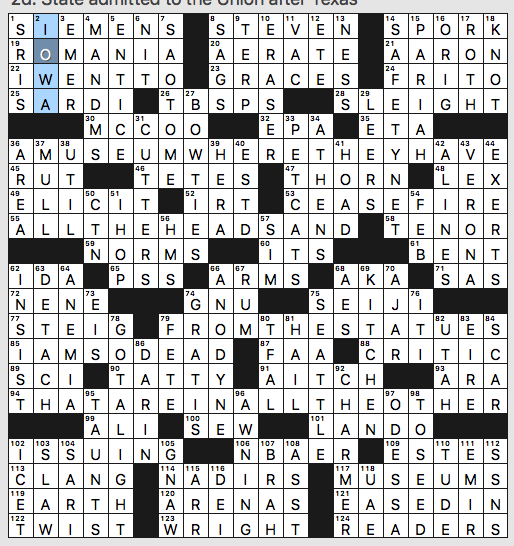 18a [“That’s way better than I can do”] TOO GOOD—Nice entry, clever clue! 58a [Get soaked, say] OVERPAY—Took me a while to get this one. I was looking for something literal. 73a [Fish dish that Nobu restaurants are noted for] BLACK COD—I know now of Nobu. At its website, about 45 locations are listed worldwide. There is not one in Arkansas. 81a [Morning fix, slangily] CUP O’ JOE—This spelling and spacing is my call, folks. It’s not in authoritative dictionaries, though clearly it’s in the language. 115a [“No way!”] IXNAY—It’s so in-the-language now that to indicate its pig-Latin origin is superfluous. 4d [Houses that may include tunnels] IGLOOS—Who knew? 14d [Continuing source of irritation] BUGBEAR—Concise, accurate definitional clue for a fun entry that doesn’t appear much. 31d [Roughly estimated] BALLPARK—Yep, this compound word is a genuine adjective. Or can be. 61d [“I know the answer!”] OOH OOH—C’mon, you know you’re smiling on the inside when you see this one.I am. 82d [Apollo 13 commander] JIM LOVELL—Looks like a first appearance for Captain Lovell. Grats to C.C. on an excellent piece of work. And thanks! 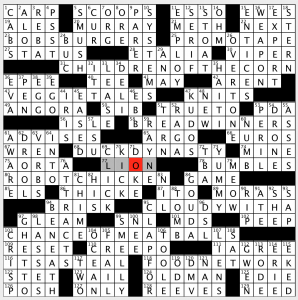 And I’m still uncertain whether the clue for 117a is an oxymoron. But you know what? That uncertainty adds, rather than detracts, from the overall positive experience provided by this puzzle! 4.5 stars. After back-to-back weeks of WaPo puzzles with quite a bit of bite, I’m starting 2019 off with a personal solve record of 9:06! 23A [Animated sitcom to watch while having sliders] BOB’S BURGERS. 31A [2009 horror TV film to watch while having an edible ear] CHILDREN OF THE CORN. 43A [Computer-animated kids’ show to watch while having lettuce and carrots] VEGGIE TALES. 68A [Reality TV series to watch while having canard a l’orange] DUCK DYNASTY. 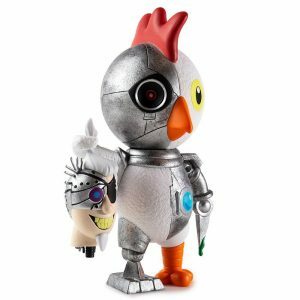 80A [Stop-motion sketch comedy series to watch while having poultry] ROBOT CHICKEN. 95A [When connected to 103 Across, animated kids’ show to watch while having beef spheres] CLOUDY WITH A CHANCE OF MEATBALLS. 118A [Channel that does not broadcast this puzzle’s programs, surprisingly] FOOD NETWORK. Okay, perhaps I shouldn’t pat myself too much on the back for setting my 21x speed record- most of these themers were served up on a silver platter (pun intended). Although the only one of the set I’ve actually ever watched is the quirky ROBOT CHICKEN, the titles were mostly very familiar. I’ve never heard of BREAD WINNERS before, but it was definitely inferable. That area of the grid was the last section to fall for me since I had DIRGE (haha!) for DRONE [Bagpipes emanation] and BUFFY for RAYNE [Protagonist of a vampire video game franchise]. Both CLOUDY WITH A CHANCE OF MEATBALLS and CHILDREN OF THE CORN I associate with the big screen, but they were produced for TV as well. And besides, don’t you secretly love a good gimme with high-real estate when you have a chance a beating your average time? The former entry being split across two rows may irk some, but it doesn’t bother me at all. Also, It was a common practice of Evan’s predecessor. Anyway, a low-calorie way to kick off the year! 91A [Had a TV dinner, say] ATE. Sly little wink at the theme/title. 5A [Couple on an ice cream date, perhaps?] SCOOPS. Adorable clue/answer pairing. 48D [Potential answer to “Where’s the beef?”] DELI. For a moment, I thought “beef” was referring to a spat between two parties. 86A [Actor Alan whose last name is a homophone of a synonym of “dense”] THICKE. Fun way to differentiate this actor Alan from the others. I liked his cameo on This is Us. 79D [“Wanna play with the laser pointer?”] MEOW. I’m starting to love these types of clues for MEOW. 59D [Protagonist of a vampire video game franchise] RAYNE. From the aptly titled BloodRayne series. Solid puzzle, and easy to chew. 4 stars from me. Didn’t know this video existed until recently. Good stuff. Even when the quip is funny, I’m not a big fan of quip puzzles, and this quip doesn’t really amuse me. I guess it’s a good thing that it was kind of predictable, since that made the puzzle easier to solve. So it’s a quip. We have the quipster at 8a and 123a: STEVEN WRIGHT. The quip, spread out over seven entries: I WENT TO A MUSEUM WHERE THEY HAVE ALL THE HEADS AND ARMS FROM THE STATUES THAT ARE IN ALL THE OTHER MUSEUMS. OK, then. 1a [Ohm reciprocal] with a bunch of obscurely clued crossings is not a good way to start a puzzle. The answer is SIEMENS. Thanks for the quotation marks in 3d [Hosp. “room”], because the EMERgency Department is not a room. 14d [Circus security] had me thinking guard, not acrobats. It’s SAFETY NET. 27d [Dressy pasta?] is cute! It’s BOW TIES. 75d [Mariner’s home] is SEATTLE. I got the first three letters and wanted something on or near the sea. What I didn’t know before I did this puzzle: that more than 400 million M AND Ms are produced daily. This entry was posted in Daily Puzzles and tagged C.C. Burnikel, Evan Birnholz, Garry Morse, Zhouqin Burnikel. Bookmark the permalink. 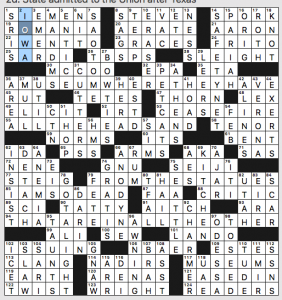 NYT: Gave it a 3 after completing it (had no idea what the theme was) and a 5 after reading about it on Xwordinfo. NYT: Well, I was feeling dumb for finishing and having no idea what the gimmick was. I’m glad others found it challenging. But it’s very clever and the fact that the theme answers were so normal as to not give any sort of hint is testament to the cleverness of the constructor. Brava! I had to have someone explain each pun to me, as well as the whole concept of a Dear John letter. I don’t believe many other cultures have such a quirky way of describing how a woman might dump a guy! Nowadays, maybe it’s turned into a Dear John Tweet? I believe the constructor is also an immigrant. I wonder if she too learned the expression after coming to the US and found it amusing? There were so many good entries in here! I thought at first that a baseball theme would emerge, despite the fact that I couldn’t think how the title would represent such a theme. The aha moment was lovely. I also love MOLESKINE notebooks and have, really, a lot more than I need. In 2019 I am going to use stuff I already have. Why not? Thank you for a terrific start to my morning. WaPo: Zero, nada, nil, no points at all. Nothing here for anyone without an encyclopedic knowledge of animated kids shows. Sorry, Evan; this one was a joyless slog, not up to your usual standards. Oh … and bonus points for reminding me that such a family as Duck Dynasty exists. I’d a different experience than others of the NYT. I got the theme quickly enough, although the theme fill remained slow to come. But overall the fill was unusually hard for me for a Sunday. Hard to say why the challenge, but perhaps in part I just had too many wrong entries to fix right away. So I’d NTH for an ordinal suffix, ONE for the golf term, NUVEA for the cosmetic brand, ALTI for height prefix (Midwesterners will have the edge there from a crossing), box CEDAR, and CUPA JOE, while wondering where the second P went. (CUP O’JOE is a new spelling to me, too.) I sure knew what NOBU is but the answer was still one of my very last to fall. (I’ll never eat there; costs a fortune.) Other things new to me included the term for handyman. So definitely a challenge, but not bad. WaPo: Despite having seen zero of these shows, I loved the theme. I thought all of the answers were easily inferable. Plus, Cloudy With A Chance of Meatballs was a favorite of my son’s, and an excellent read-aloud. I laughed out loud at some of the clue/answer pairs: MEOW! SMUSH! I also liked the siren clue pairs, and the non-theme food- and TV-oriented Easter Eggs to discover. So the letters aren’t just Dear Johns because they spell Dear John but because they split from, break it off with, the theme answers. Didn’t see that originally, or written about, and really ups an already very clever theme. Until I figured what was going on (finally saw the positions in the compounds) I thought maybe we had some kind of anagram thing going and you can find toilet in STOLEN THIRD. why Breaking News? because dear john letters break news? does that really have anything to do with the gimmick which is wordplay on “letters” and a word game in the theme answers? Breaking News because what else are you going to call it? and dear john letters just because how else are you going to use “letters” as a pun in a phrase? “and a literal hint to the answers of the starred clues” seems an odd way to put things, a way to make things harder I suppose Wouldn’t it be clearer to say something like “and a literal hint to how the starred answers can (or should) be read” or something like that? I think Dear John Letters are sent to someone you are breaking up with. The letters are delivering the news that you are breaking (up). It’s been a while since I saw a puzzle that both outsmarted me and impressed me. Awesome NYT Sunday Puzzle. 5 stars. Mike, I think you’re right. 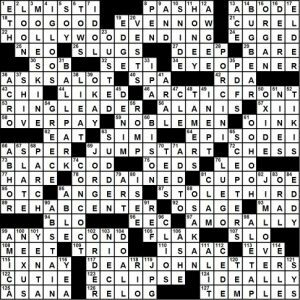 Only the larger Sunday puzzle has a title. All over the puzzle boards, people report having trouble figuring out the theme of this puzzle even after it’s been solved. The fault is not in the solvers, but in the DEAR JOHN LETTERS clue. That clue was not a literal hint; at best, it was a literal explanation. Or, perhaps, result of taking clues literally. But the placement of that “literal” is what had me looking in the wrong direction, until my husband, who doesn’t get caught up in grammar, finally got it, and told me to completely IGNORE that clue. Then, I finally got it and felt cheated that it really wasn’t a playfair whodunit because of the bad cluing on the helper. Ideally, I’d have liked the theme answers to help fill in DEAR JOHN LETTERS. So great gimmick; bad execution.